When it comes to grouting the colour choice can completely change the look of your tiles. White is classic, timeless and gives any room a clean updated look. And whilst it is classic, its also very affordable, and will never go out of style. It’s not all good though as white grout gets dirty much easier than darker colours. When using a pale tile white grout is much more forgiving so any discrepancies in lining up are not highlighted and white grout can make a smaller room feel bigger. If you are looking for something more dramatic then why not choose to accentuate the grout by choosing a grey grout. A simple white metro tile is instantly updated with a grout that highlights the lines and tile formation giving a vintage industrial look. Grouting is the last step in a tile job, and unless done well can spoil your tiles. Choosing the right tools and materials will make for a successful grouting job. So what will you need? 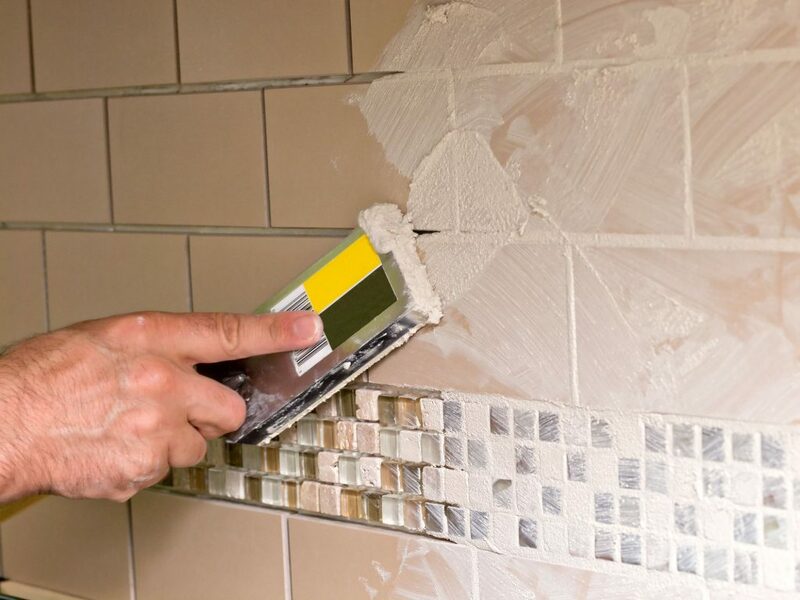 Grout float – Use the grout float to apply the grout to the tiles, filling the joints by pushing the grout at an angle to the joints with a grout float. Sponge – Remove grout from the face of the tile with the corner of a damp sponge. Bucket – You will need a clean bucket of water so you can wet your grouting sponge and wring it out until it’s just damp. Utility knife – Use a utility knife to remove grout from inside corners and along the sanitaryware to make room for caulk. Top Tip: Don’t spread too much grout at once as once it does start to harden, you will really have a hard time trying to clean it off the tiles before the grout turns rock hard. Start by spreading grout onto a 90cm square area and concentrate on finishing the grouting, shaping the joints and cleaning each section before moving on to the next section. After applying the grout, it is important to clean off the surface correctly. Firstly it is important to start with a clean bucket of water. When wetting the sponge, make sure you wring it out until it’s just damp. Don’t use a dripping wet sponge to clean grout from the tile. Drag the sponge in a continuous stroke up the wall. Rotating the sponge and repeating the process until you’ve cleaned the entire area once. 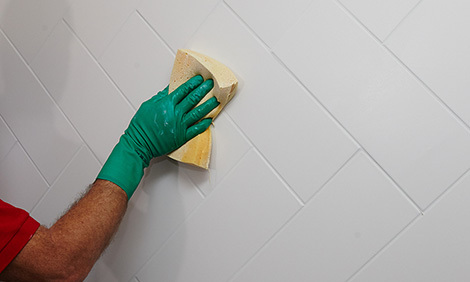 Clean the tiles two or three more times using the same process until they’re free of grout residue. A thin film of grout may appear when the water evaporates, buff this off with a soft cloth. Grout can be prone to stains and damage from water without proper cleaning and maintenance, it can become stained and mildewed, and even cracked. Ideally a daily wiping routine after use will help to keep your tiles clean. Weekly or bi-weekly deeper cleaning using a baking soda paste, rubbing it into the grout with an old toothbrush will help to keep clean. For seriously stained grout you may need to use bleach to get rid of the stains.